Wear this comfy button-up as a lightweight jacket or alone as a dress. It’s wrinkle-resistant and quick-drying for easy on-the-road wear. Arc'teryx’s Contenta Shirt: What is it? Arc'teryx’s Contenta Shirt is a casual, button-up shirt made from soft, stretchy fabric. 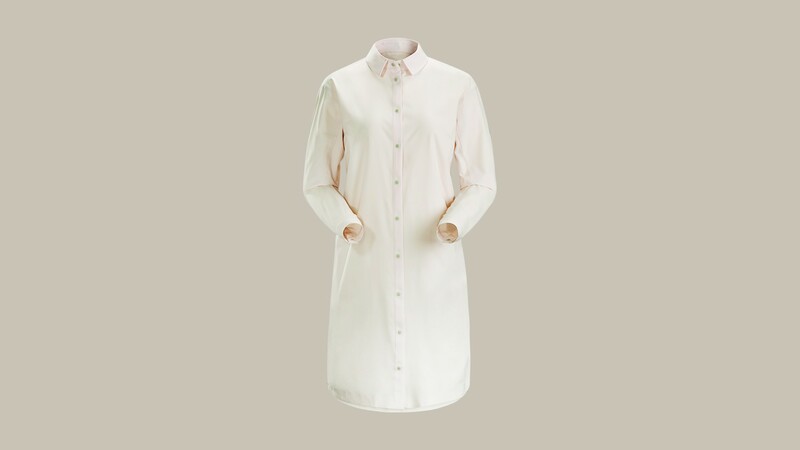 The shirt’s long length means you can wear it as a light jacket or topper when you need an extra layer; or button it up and wear it alone as a comfy shirt dress. The shirt is constructed from Diem, a polyester fabric that’s wrinkle-resistant, quick-drying and generally uncomplicated to wash and care for. Arc'teryx’s Contenta Shirt: Why do I need it? The shirt’s versatility makes it an ideal travel piece if you’re looking to pack a little lighter – you can wear it different ways and incorporate it into various outfits. The shirt’s low-fuss fabric minimizes wrinkling when it’s packed up in your luggage, while the fast-drying fabric makes it handy for longer trips where you might need to do laundry on-the-go. The loose fit makes this shirt great for layering, but it’s light enough to wear in hotter climates, too. The lightweight fabric is designed to help moisture vapour escape and regulate body temperature. The shirt is UPF-rated against ultraviolet radiation, so it’s a nice outer layer to toss on for protection if you burn easily. Arc'teryx’s Contenta Shirt: Should I buy it? The Contenta checks all the boxes you could want from a travel shirt: It’s simple to pack without wrinkling; adaptable enough to wear with a variety of outfits; and transitions from cooler to warmer weather. Plus, unlike a lot of functional travel clothing, it’s stylish enough to wear at home. Pack this shirt whenever you’re not sure what the weather has in store, or whenever you’re looking for a lightweight piece you can wear multiple ways.